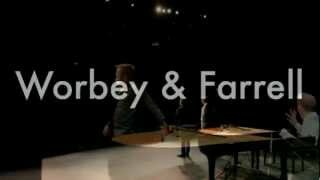 Following a totally sold out run at this year's Edinburgh Fringe, Worbey and Farrell are coming to The Crazy Coqs. 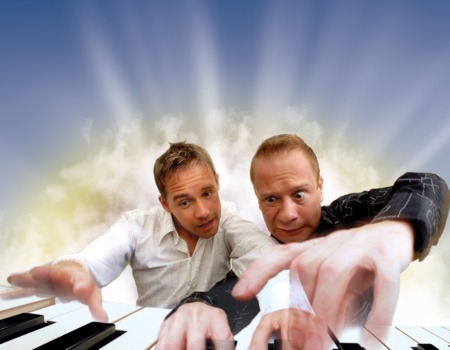 Steven WORBEY and Kevin FARRELL make up one of the world's most entertaining and unique piano acts. Revolutionary in their treatment of the traditional piano duet, they push the boundaries of the instrument, using it to illuminate music of every style - classical, popular and contemporary. Their piano can imitate the tones of a Spanish guitar, resound with their very own Paganini Variations or pulsate with the passions of the masters of jazz. They perform everything from Rachmaninov's 18th Variation to Saint-Saëns's Carnival of the Animals complete with their own verse. Their show at The Crazy Coqs will include their very own brand new composition entitled Deviations on a Caprice which is entirely based on Paganini's famous Caprice no. 24. No one has composed a work based on this classic gem for over 40 years. It was an absolute hit at the Edinburgh Festival. Combining musical thrills with a deep love of laughter, these two internationally acclaimed concert pianists have played with the world's leading symphony orchestras, achieved a million hits on YouTube and entertained audiences all over the globe with their barnstorming blend of sparky comedy and utterly sensational piano-playing. Prepare to be moved, excited and amazed. But above all prepare to laugh with joy at the sheer ingenuity and style of these two masters of musical mayhem.